Are you a startup or SME professional looking for expert advice for your business? - What are the key strengths of your business and how can you better harness them for growth? - What are best practices to overcome the challenges facing your business? - Which strategies can be used to reach your top business goals? 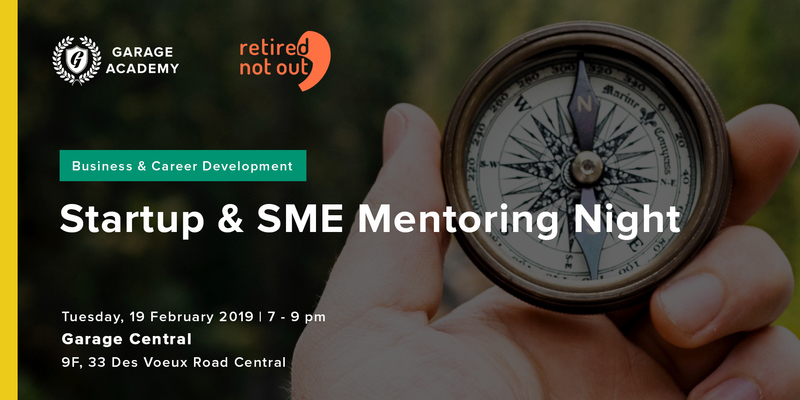 Delve into these questions and more with Garage Academy and Retired Not Out 退而不休 at our Mentoring Night to leverage and connect top business talent in Hong Kong! Register now to reserve a 45-minute face-to-face session with our mentors to make valuable connections and gain dedicated insights to take your business to the next level. Retired Not Out 退而不休 is a platform that not only aims to drive more opportunities for experienced talent in Hong Kong, but also wants to help unlock that experience and wisdom for the benefit of startups, entrepreneurs and others like you. Retired Not Out is a Hong Kong based professional platform for people over 50 to find meaningful opportunities to work, learn and network. Their focus is to build senior inclusiveness in the workforce and encourage continuous learning for mature talent to stay relevant and continue to add value to organizations and communities.